Fantastic stay at the Rubino! Our family of 6 had a fantastic stay at the Rubino Ap 5A. We arrived in early August and were met outside of the Rubino complex by Elize. We were given a tour of the apartment. Our first thoughts were that it was very spacious and the decor was lovely and very modern. We had a great time and found that whatever we needed, we had. Half way through our two week stay, we rented a car and Elize brought the garage key which was very helpful. We locked our self out once and the situation was handled really quickly and easily. Overall we had an amazing stay and would recommend. The apartment was also in a ideal location right in the middle of Calpe. We were surrounded by gorgeous beaches and oceans. Every window you look out of in the apartment has a spectacular view. We appreciate you reviewing for us and being such a great guest to have with us. You're welcome back ANY time (as long as you pre-book!!). The apartment was bright & modern with good room for our family of 5. It was very comfortable, we slept well despite the August heat due to good air conditioning. The balcony was great to use and had a perfect view down the beach towards the old town. We enjoyed pool days, there's plenty of space around the good sized pool and the view of the harbour with the rock towering above and out to sea was always engaging. Rubino is situated in the middle of 2 long beaches each with an interesting promenade so walking out for beach days and meals in the evening was easy. Thanks for your review of our apartment and location. We're glad you had a lovely holiday and we welcome you back whenever you wish. Great apartment with fantastic balcony views. Contacted Tim from the property details when he answered all the relevant questions we had with payments and deposit sent off. We had been to Calpe on day trips in the past and liked the vibe- busy but not over busy. We met up with Elize at the apartment - at the time agreed where she gave us the usual introduction - extensive info is in the apartment folder. The Apartment is of a high standard and we enjoyed a comfortable stay over the 7 days with no negatives to report. The position is first class, we had walked past the apartment on our day trips in the past and could not believe our luck, that we were now staying in such a great front line location in Calpe. The pool area is alongside the coastal path on the walk from the Old town to the rock/Penon. It was great to be by the pool during the day whilst also enjoying a sea view. The pool area was most relaxing with sufficient sunbeds for our group of four everyday - who were not early rises. The World cup was on at the time of our stay and we were well looked after at Mutsys sports bar across the road- All the staff and locals made us most welcome. The Razo restaurant is also very close to the apartment where we enjoyed a couple of very good meals. On other evenings we either walked into the Old town or down to the Port. Many restaurants are listed in the apartment info folder. The seating in the lounge was comfortable and the TV included UK channels, which was a bonus following our experience at some apartments who only have BBC world service, if you are lucky. The balcony with great outdoor furniture is a fantastic spot to have a cool drink ( ours was a G & T ) whilst watching life go by over the sea and on the Calpe beaches. The two bedrooms are well furnished with sufficient wardrobe space and the bathroom scenario with one en-suite and one separate was ideal for four adults. Overall, I would highly recommend this property and we will certainly book again in the future. Following our stay we had contact from Tim who checked we had a good stay and returned the deposit in full, via a Bank transfer. It is always a concern when you book a property direct first time, I would have no qualms in booking with Tim. Thanks for your great service and our stay at your top class property. Wow.....what a great detailed review! Many thanks indeed....come again whenever you wish. Tim's apartment in the Rubino is ideal location close to the beaches, port and the local bars, the apartment is immaculate and well maintained supported by a good service and one I wouldn't fail to recommend if you like doing your own thing either laze by the pool or on the beach five minutes away and a stroll to the local bars. Thanks for visiting us again this summer. Hope to see you in 2019. Thank you for your very kind review too. A comfortable apartment in a great location. This is a comfortable apartment, which is in a great location. This is the best part of the Calpe seafront, it is quiet and beautiful. You are a short walk from restaurants and bars. Literally two minutes away is our favourite bar called Acuarios. The best adverts we can get are people who come back ! Please keep coming back, you're a pleasure to host. 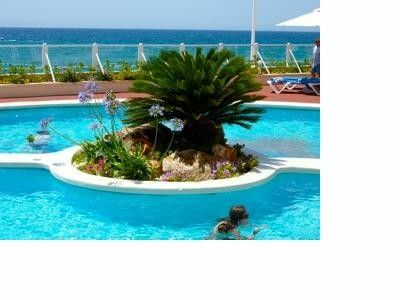 - Piscinas perfectas para ir con niños, y buena mezcla de zonas de sol y de sombra. - Muy buena localización, con playas muy cerca de la casa, especialmente una cala ideal para estar con los enanos. - Vistas estupendas al peñón. - Tim y Elize fueron muy atentos con nosotros. - La cocina tenía una estantería peligrosa para niños pequeños, además de una bombona de butano al aire. - Las puertas de toda la casa estaban estropeadas por una avería de una tubería y no cerraban bien. Esto era especialmente molesto en la puerta del cuarto de baño, y debiera haber sido arreglado antes de nuestra llegada, o al menos durante nuestra estancia. Thanks for your review. We appreciate the positive comments you have made. We are not sure sure what you mean about the butane bottle, but we can easily remove aspects that you feel might not be child-friendly, or you can ask us when there. This is your second visit to us I believe, so thanks for coming back. Gracias por su revisión. Apreciamos los comentarios positivos que ha hecho. No estamos seguros de lo que quieres decir con la botella de butano, pero podemos quitar fácilmente aspectos que creas que no son apropiados para los niños, o puedes preguntarnos cuándo. Esta es su segunda visita a nosotros, creo, así que gracias por volver. Prices may be subject to change at the advertiser's discretion. Prices are in GBP. Euro & Dollar rates are approximate conversions and will vary slightly. For longer term rates please contact us. Changeover days are on a Saturday. We operate on the basis of excellent and personal service and we want you to come back to visit with us, and tell your friends.